I was super excited that last week I finally received the backer reward for the first Kickstarter campaign that I ever backed–Digital Boss Monster! 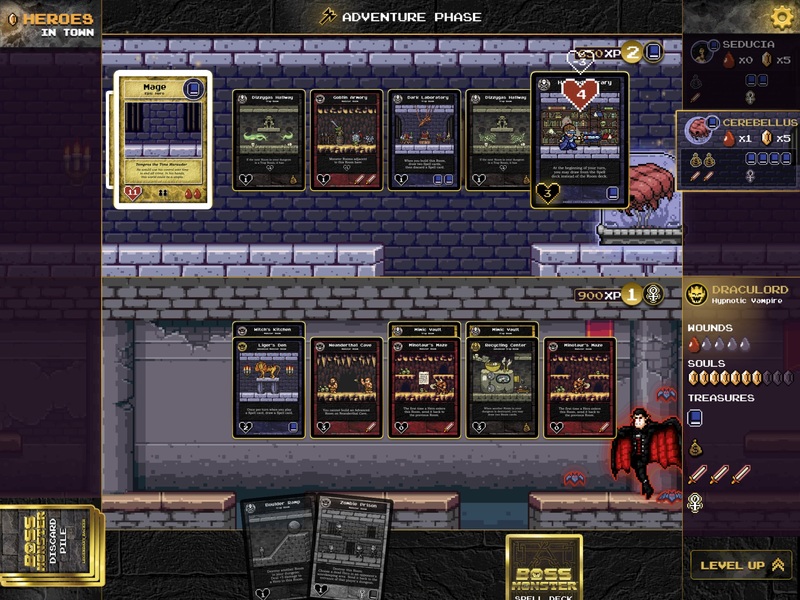 That’s right, a card game based on videos games now has a video game version of it! 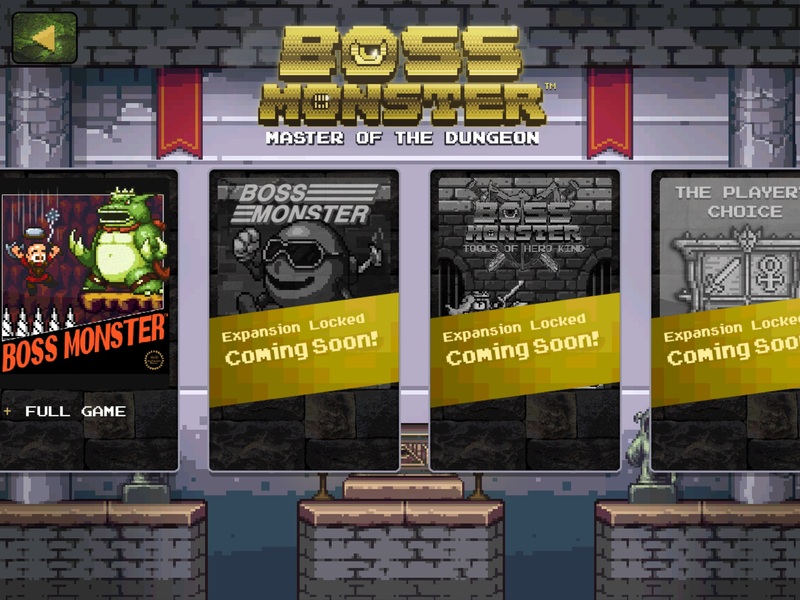 In Boss Monster you are the end boss of an 8-bit, side-scrolling video game and you’re trying to build a dungeon to lure in heroes for you to kill. You do this by building rooms with various treasures full of monsters or traps that will hopefully do enough damage to the heroes to finish them off so they don’t stab you in the face and you can take their souls. 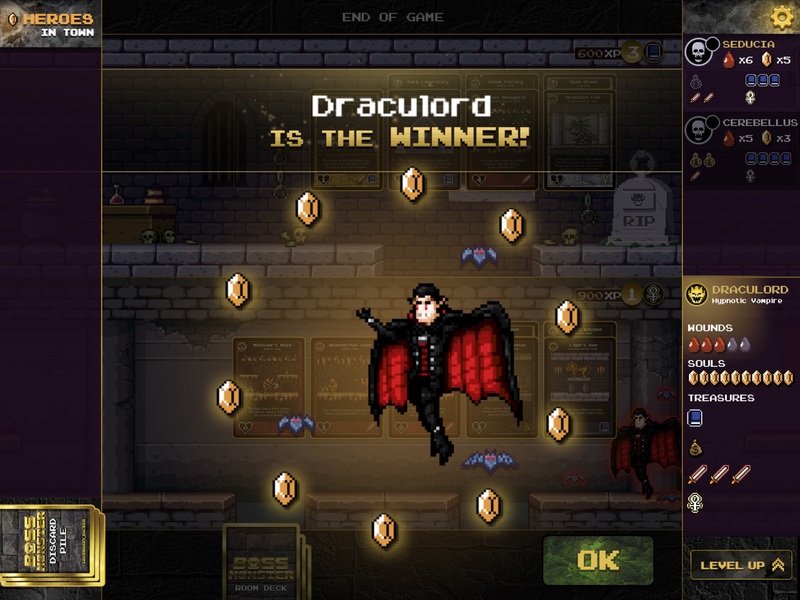 The first boss monster to collect ten souls or last monster standing wins! 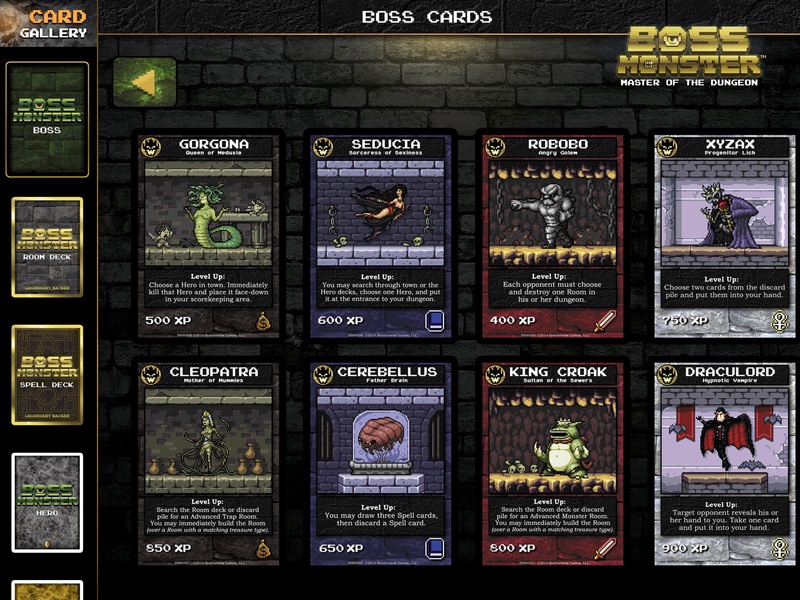 I have played the original tabletop version of Boss Monster and give it a 4.5 out of 5 stars, that’s one of the major reasons I decided to back the Kickstarter to make a digital version of this card game. This review focuses on the digital version of the game as opposed to all iterations of it. The version I have and am reviewing is the iOS version, which is ony available for iPad and not iPhone–unfortunately there isn’t enough room on an iPhone screen for this game. This game is also available on Android tablets and is supposed to be released on PC very soon (I believe they are releasing it through Steam). 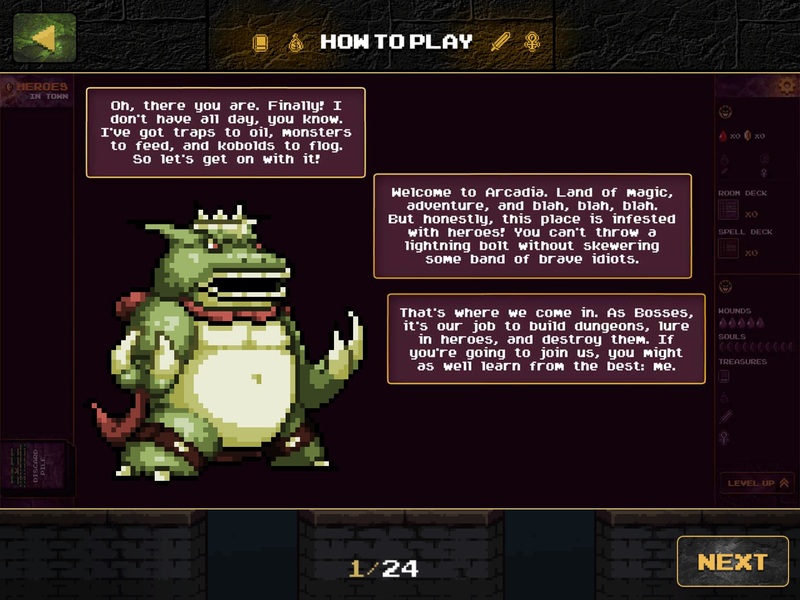 Digital Boss Monster is very true to the feel that lies at the heart of the game. The startup and loading screen look straight out of games I grew up with and the music and sounds throughout the game are spot on to old 8-bit side scroller games. The graphics and animations are crisp while maintaining the classic 8-bit aesthetic. Something else that I felt was really cool and reminiscent of old school 8-bit video games is that to enter my Kickstarter backer redeem codes, I had to click and hold on the right part of the load screen and then enter the code into something that looked like a screen you would enter a code into for an old video game (it felt a little like the code screen on River City Ransom, one of my favorite old Nintendo games). 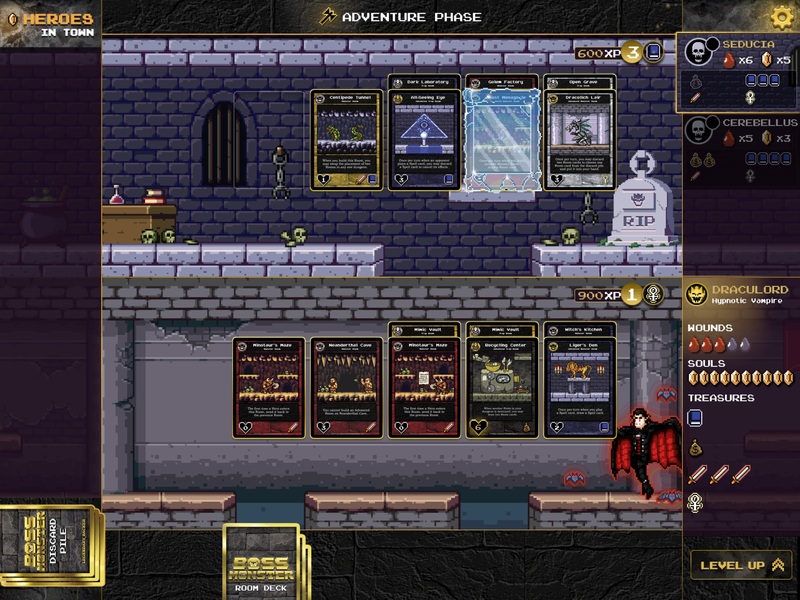 The gameplay in solo mode is very smooth and feels very much like playing the card game, just against a computer. 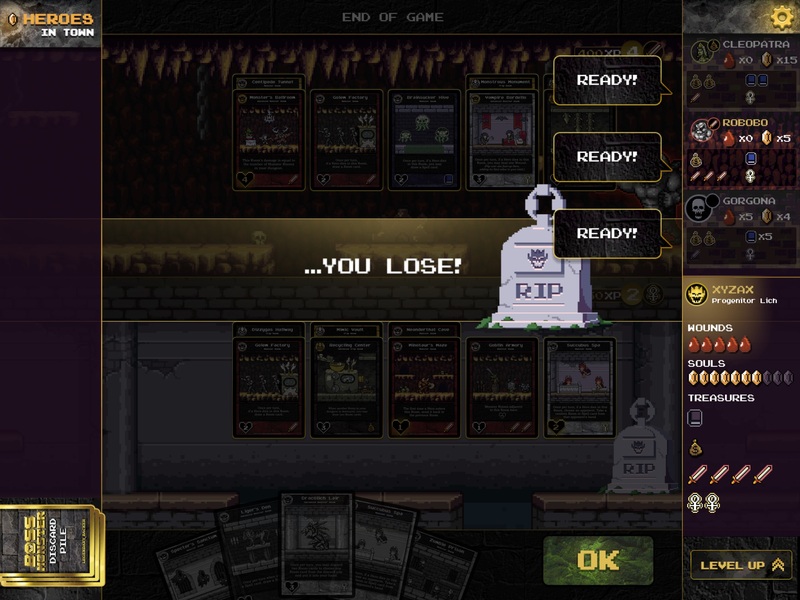 So far the AI in the game seems intelligent enough for it to win sometimes but not so smart that the player always loses (right now I’m at about a 50-50 win rate myself). Unlike some other boardgames turned apps that I have played, in a solo game against two or three computers the computers target each other and you equally instead of all just ganging up on you. The pass and play mode feels a bit clunky with all of the stops during the adventure phase. 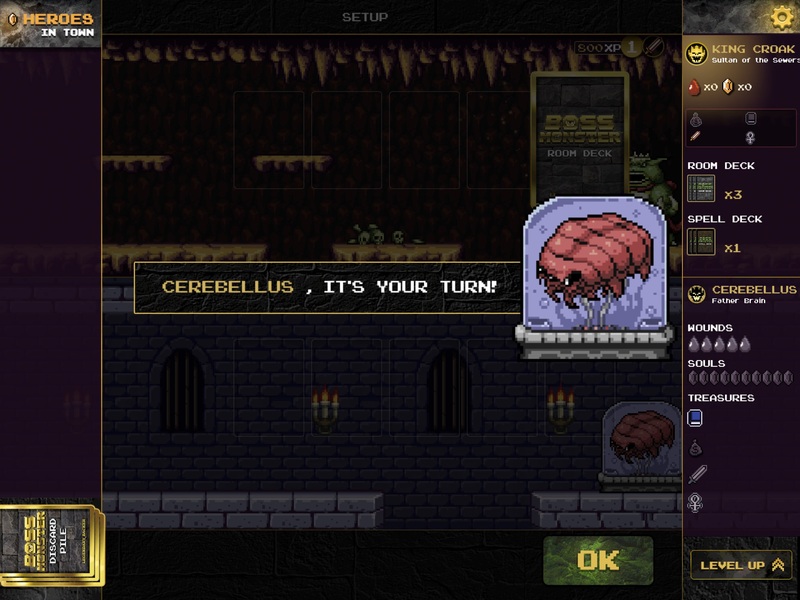 Casting a spell against another player feels like it takes way more clicks than it should. Another downside to the pass and play mode is that it can only accommodate two players (and no AI players). 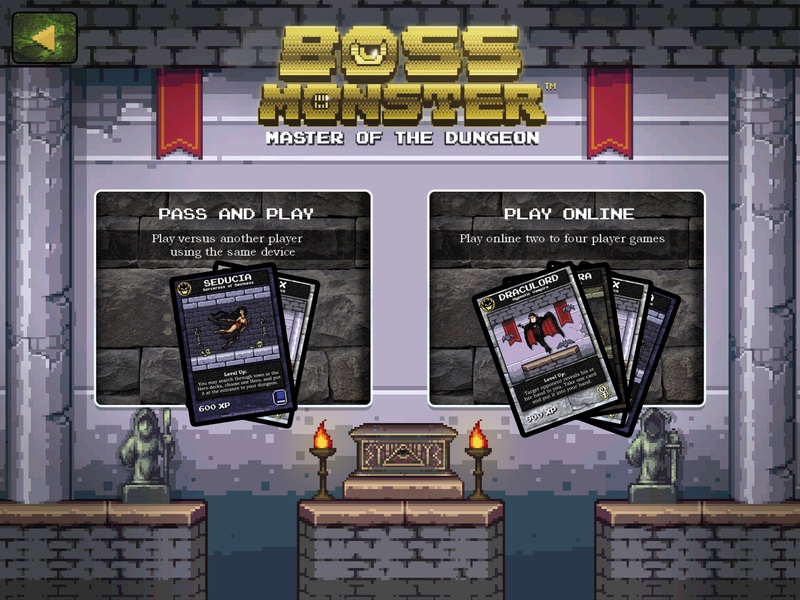 Unless I were somewhere that I had my iPad but didn’t have any games with me (a situation that is quite rare), I would probably opt to play the tabletop version of Boss Monster instead of the Pass and Play version. I have not had a chance to try out the online version of the game yet–I don’t know anyone yet who has downloaded this app and when I tried to log into a random game, I sat waiting for other players for five minutes. Hopefully this will work better once this app has been out a bit longer, it was just launched for iOS less than a week ago. My assumption is that iOS users will only connect with iOS users and Android users with their ilk, but I have no confirmation as to if this is the case or not. 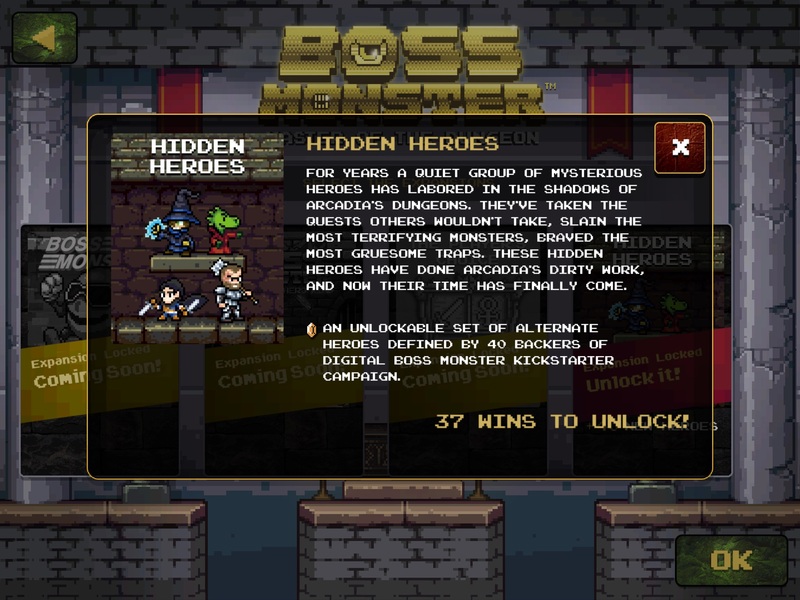 The Kickstarter campaign for Digital Boss Monster was funded to the point to unlock the existing Tools of Hero Kind expansion as well as the new Power-Up Pack and Player’s Choice expansion. Unfortunately these expansions were not available at launch. I will post an update once these go live. One piece of “unlockable content” that is currently available is the Hidden Heroes set. This set contains special alternate heroes to run through your dungeon and unlocks once you have scored forty wins in the game. As I have yet to actually win that many times, I cannot speak to what it actually contains. 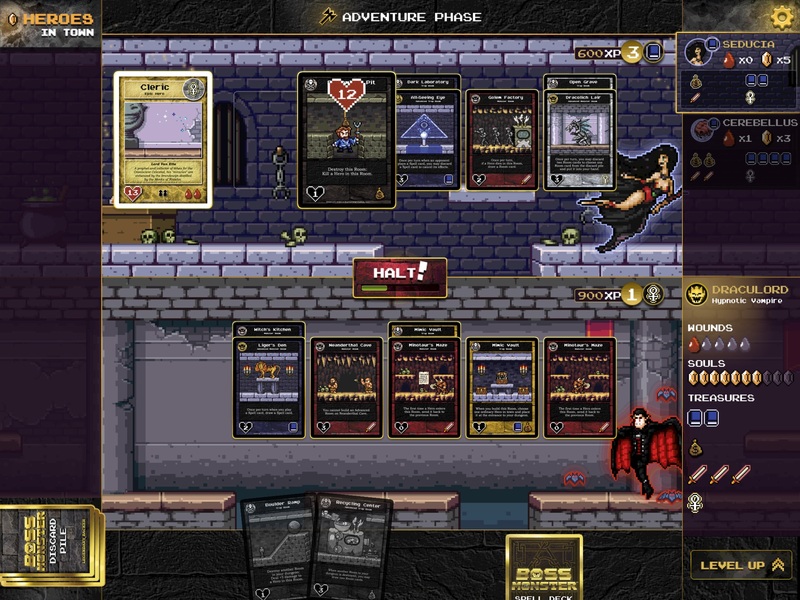 The game also does come with a nice tutorial to teach you how to play and a gallery of all of the cards so that you can give them a read outside of an active game–I recommend reading the flavor text on all of the heroes, all of them are great gaming and pop culture references. Overall, the solo play version of this game is really great and I know I will have a lot of fun rocking the solo mode when I want to play a boardgame but no one is around. I give the Digital Boss Monster Solo Play Mode 4 out of 5 stars. Unfortunately not all of the modes of this game are as nice. As I said before the Pass and Play version of this game feels clunky and is limited in its capabilities, so I give the Digital Boss Monster Pass and Play Mode 2 out of 5 stars. I cannot currently give the online version of this app any kind of rating due to not being able to access it yet. That means the Online Play mode of this game earns it a ??? our of 5 stars and I’ll have to update you all once I have be able to access it. 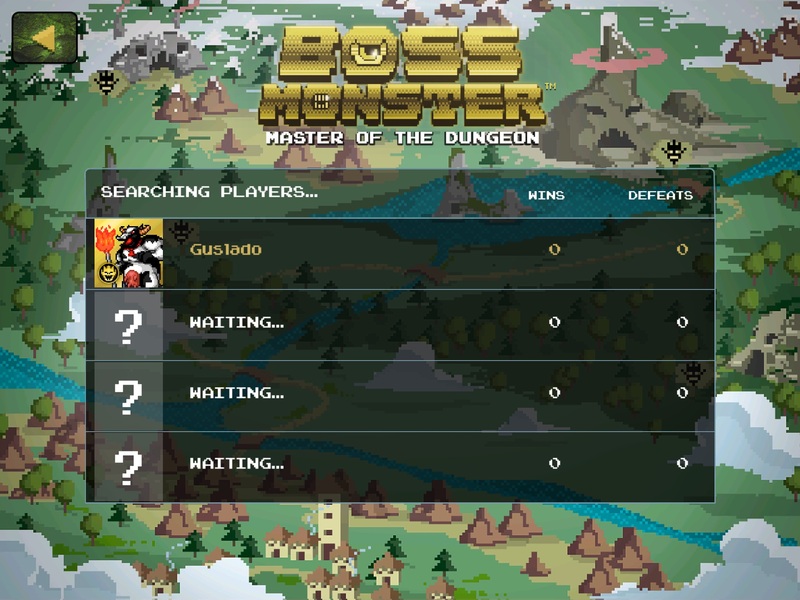 Currently Digital Boss Monster is available on iTunes, Android, and Google play. It would appear that a limited two player mode is available to download for free with in-app options to purchase the full version, so there is no reason to not at least give it a go.